Acting president, Yemi Osinbajo, orders release of N1.6bn to 16 states affected by flood – Royal Times of Nigeria. 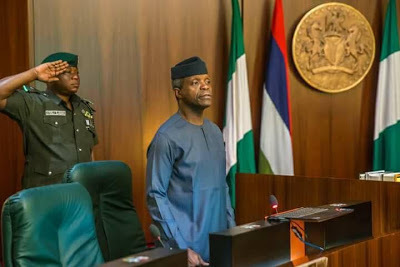 Acting President, Yemi Osinbajo, has directed the Minister of Finance, Kemi Adeosun, to immediately release N1.6 billion to 16 states recently ravaged by floods. Senior Special Adviser to President Buhari on Media and Publicity, Femi Adesina, announced this to state house correspondents after the Federal Executive Council meeting today. Adesina said the funds which would be drawn from the Federal Government’s Ecological Account in the CBN, is to help cushion the effects of the disaster on residents of the affected states. He added that the money would be released directly to the National Emergency Management Agency, NEMA, for onward distribution to the affected states. The benefitting states are Ekiti, Osun, Akwa Ibom, Kebbi, Niger, Kwara, Ebonyi, Enugu, Abia, Oyo, Lagos, Plateau, Sokoto, Edo and Bayelsa. Lagos state witnessed torrential rains last week that resulted in massive flood which affected many areas in the state particularly Lekki, Lagos Island and Victoria Island.